On Black Friday, while millions were flocking to the malls and superstores for deals, my family relaxed at a beautiful Austin location–The Lady Bird Johnson Wildflower Center. 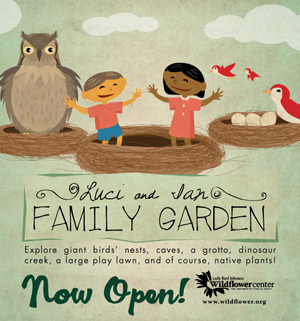 The new “Luci and Ian Family Garden” is just wonderful. In fact, my son says it’s like “A Village of Wonder!” He could have stayed for a few hours which is really saying a lot because we normally just spend around 30 minutes at most places due to the usual cuprits–crowds, noise, or boredom. While we were there, he was wandering around and exploring and really grooving on the beauty of this new addition to the Wildflower Center. It’s “autism friendly” because there is just so much space to roam and no prescribed way that visitors are expected to interact with the park. This kind of natural setting + open areas = our most successful outings. Also, as a bonus for the entire family, the Lady Bird Center boasts a restaurant. It’s small and quiet (perfect for keeping sensory overload at bay) and has several gluten-free options. Nothing specifically gluten-free, but there are options, like baked potatoes, salads and chicken dishes. From this limited menu, we were able to cobble together a very healthy meal for our son who is on the gluten-free, dairy-free diet that many kids on the spectrum live on. On the Autism Friendly scale: Our family gives this family field trip location a BIG thumbs up for beauty, calm, and best of all, wonder.